In Italy, one finds clams the size of one’s thumb which are as tender and lovely as lovely can be. Regrettably, I’ve never found clams of that nature in the US. 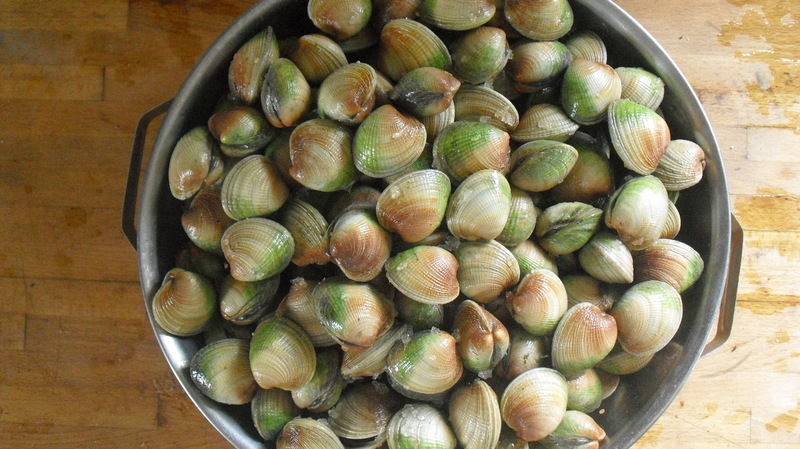 The smallest littleneck clams are still too big, and worse, too tough. They lead to as much frustration and longing as joy. So I was intrigued to come upon cockles in New York a year or two ago. They seemed just the right size, but would they be as tender as their Italian cousins? I brought them home, steamed them, and was amazed. Not only were they as tender as any Italian clam, they had the most exquisite brininess, and I was immediately hooked. And so I was delighted to cook cockles at the restaurant recently, for a rare menu which momentarily abandoned our dedication to local ingredients and treated us and our guests to a rare global experience of the most delectable creatures of the sea. For me, the cockles were the star of the show, and here’s how we cooked them. 1) Begin by soaking the cockles in plain water for a few hours. We’ve never detected any sediment or grit, but habits die hard. 2) Saute in olive oil a little onion, or garlic, or shallot, or all three in a pan that can accommodate the cockles. When onion or garlic have become lightly colored and aromatic, raise the heat to high and add the cockles with whatever water clings to their shells. Cook for a minute and then add some liquid, either white wine, fish broth, or just plain water. The cockles are briny enough that no salt is necessary, though black pepper or hot pepper would be desirable. 3) As the cockles open, remove each one to one large or several smaller bowls. If necessary, cover to steam some open. When all have been removed, add more liquid if the pan has become too dry. If there’s too much liquid, reduce. Add some chopped herbs: parsley, basil, oregano, or a combination. Pour the liquid over the cockles, and serve at once, either in one large bowl or in smaller individual bowls. ¼ to ½ cup cockle broth per person is a good amount. Serve with plenty of crusty bread for soaking up the broth. In Brooklyn they are at SeaBreeze Seafood on 18th Ave & 85th St. Got them all the te foru seafood fra diablo!